The use of penal mediation implies a change of mentality in an already highly Court-centred society that considers Courts se the only way to solve conflicts. Criminal law aims to clarify whether the alleged facts existed or not, and what is the defendant’s degree of responsibility. Mediation has a different approach: it pursues the victim and the offender’s own recognition of a conflict, seeking to achieve a restoration settlement that allows the victim to be satisfied, and the perpetrator to be reintegrated into society. With regards to the problem of aliens in terms of the penal law, and the current trend to expel them from the territory, it is possible to use penal mediation and mediation for relational conflicts in aliens’ detention centres. It is suggested in this paper that restorative justice and mediation do not constitute new systems of administering criminal justice but that they relate to customary justice systems. Criminal Law aims at determining whether a reported fact existed or not, if the defendant actively participated in it and what is his liability level. 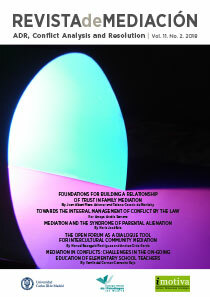 Mediation, however, has a different starting point. Penal Mediation is a conflict resolution means within the so-called «restorative justice» according to which a third party, called the mediator, a neutral and person with no decision power, helps the victim and the offender to find satisfactory solutions or settlements for both of them. Mediation provides the parties with the possibility to get satisfaction. For the victims, it fosters their own active participation in sorting out the conflict that affects them. It allows for reparation of the damages endured and favours the recuperation of personal tranquillity. On the other hand, for the defendants, mediation facilitates awareness raising and the opportunity to take responsibility for his their actions and consequences, as well as the possibility to understand the offence and get the benefits envisaged by the Penal Code. Lastly, for justice in social terms, mediation offers a new understanding, new forms of criminal responses that have an educational meaning, promoting attitudes of responsibility and reparation. The role of the mediator is important as only his/her presence alters the normally uneven balance of power between the parties. 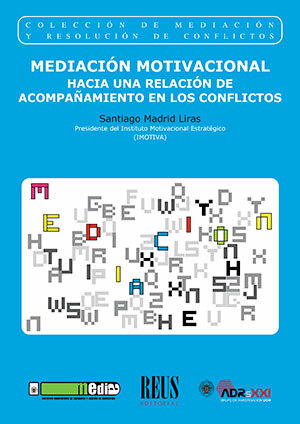 Improving communication between the person or the group and the intervening official or between the entire system in the conflict and the public administration – a more positive peaceful environment is offered to them, which helps all the parties involved in a group intervention – restores one group’s initiative and helps to make self-knowledge and self-control grow. These are the goals of the kind of social work that training in mediation styles and techniques can promote. An imprisonment sentence for a criminal is perhaps more harmful than beneficial, as this is not the main purpose of our criminal law, which is the rehabilitation of criminals. Therefore, the systematic application of the Penal Code is not justified, that is, a case by case analysis should be appropriate, especially for persons who commit a crime for the first time; inquiring about the motives that led to the crime is relevant and also establishing conflict resolution options to go beyond retributive measures. Thus, the reparation of the harm inflicted can be favoured and also taking responsibility by the offender, and the «re-victimisation» and the passive role of the victim can be avoided. Hence, mediation in the criminal field aims at achieving a reparation settlement, encouraging the victim’s participation and the reintegration of the offender into society through a community participation process (mediator) that somehow commits to and involve different members of the community not only to resolve the conflict but also to implement the settlement and follow-up the interpersonal relations between the offender and the victim. Therefore, there is a reversal of the criminal political end of formalised Criminal Law that is only legitimised when applied ultima ratio and in a fragmented way to sort out the most serious social conflicts (and not to obtain social peace between the parties confronted to each other because of a crime). Mediation must be understood as an instrument in the service of a specific decision of the State to waive a sentence when it is not necessary for prevention public purposes and when the individual interests of the victim can be adequately satisfied. Penal Mediation can be used with offenders, either alien or national, in different stages. The first possibility of mediation arises during the police investigation phase, prior to filing the report/legal action. Pre-trial penal mediation constitutes an alternative to the legal process and therefore it excludes the intervention of the criminal justice system in cases where a settlement between the parties is reached. It is very difficult to implement this mode of mediation in Spain because some crimes are prosecuted ex-officio. However, it could be relevant for private or semi-public crimes, i.e. those that are not considered serious enough to affect society’s public order and cannot be prosecuted ex-officio by the public power (police, judges or the Public Prosecutor). The second stage for mediation to be used is when the person has been charged with a crime, i.e., intra-procedural mediation. The deadline to conduct the mediation process both for the preliminary proceedings and the summary trial is of one month upon signing an informed consent. However, the Judge can extend the deadline, at the request of the Mediation Team, when there is a chance to settle and therefore, longer time is required (flexibility principle). The results obtained thanks to mediation will have different effect depending on the stage in the process the restorative process is conducted as it implies the application of restoration extenuating circumstances under Section 21.5 of the Penal Code or a conviction on the terms sought by the Prosecution. The last stage occurs once the conviction has been issued; mediation is possible and it has an effect on the execution of the punishment, either by applying criminal substitutions, or having access to parole. The criteria for the Court to refer to mediation are, in the first place, subjective criteria, according to the different personal abilities and the specific situation of the person; and secondly, flagrant facts. The cases where the victim does not wish to participate in the mediation process, or in the event the process is interrupted by the victim, the Prosecutor and the judicial body in charge will be able to assess the will of the offender and the actions effectively taken to restore the damage in order to apply the corresponding punishment. Currently, with the reform of the Penal Code the Parliament is undertaking, and with the extinction of minor offences, the latter are the perfect candidate to be sent to mediation. This would imply to take them away of Criminal Law, making legal actions more agile. Currently, 15 or plus minor-offence trials are conducted in one session, but most of the cases can perfectly be submitted to mediation, as it gives the opportunity to address the issues related to the case in a more detailed deeper way. This could be considered as something that distorts the ends of Justice. Having briefly presented penal mediation, we now turn to propose the possibility of using this kind of mediation with the aliens that have been accused of a crime. In this connection, the Spanish law on aliens seems to pay more attention to the security measures imposed on those who enter the country than to educate them and try to integrate them into society. However, the relationship with migrants requires specific training that can be done by a lawyer, a psychologist or a social worker. But there are some issues that affect this group and demand special sensitivity, given that they can cause conflicts to arise (between the migrant and his neighbours, or between the migrant and the education system, or between the migrant and religious education, etc. ), where the assistance of someone specifically trained in mediation is necessary (be this person a lawyer, a psychologist or a social worker). Bearing in mind that the main idea is the need of penal mediation, it is necessary to resort to it as an alternative to imprisonment, especially for aliens with whom mediation can be used as a replacement to expulsion of convicted aliens from the national territory. Using mediation in the criminal system allows for a reduction in the current judicial congestion and applying restorative justice as an alternative to Criminal Law, like in other branches of justice; this requires a change of mentality in society so that managing conflicts can be understood based on responsibility, participation and the key role of the parties involved in a dispute, as well as the role they play in sorting it out (which produces a reduction in the task of courts to deal with problems). Moreover, it is necessary to use mediation so that aliens detention centres can work better; on the one hand, the deprivation conditions are similar to those in prisons where mediation is being used with optimum results. On the other hand, aliens are imprisoned because of penal processes or administrative infringements. The difference between Aliens Detention Centre and Correctional Facilities is that the latter have precise detailed legislation stipulated by an Organic Law and Regulations that determine their internal operation. But Alien Detention Centres were simply created by a Ministerial Decree in 1985, which did not require the consent of the Council of Ministers or its publication in the State Official Gazette. Their internal regulation, however, was only defined fourteen years later, in 1999, via a Ministerial Decree dealing with fundamental rights. The lack of norms concerning such important issues like offences and punishments of inmates made the Centre Managers to act on their own discretion to impose corrective measures on the inmates that did not respect the norms, but there is no specification about what are these norms. Even if in 2003 after a decision of the Supreme Court the most important aspects of aliens detention centres were upgraded and included in the Aliens Act, it is still the Ministerial Decree that governs all the matters related to their regulation and internal rules. The future Law on Criminal Proceedings must include mediation as an instrument of the criminal justice, considering the principles of the parties own determination, confidentiality, contraction, flexibility and judicial control, and the promotion of mediation in all its phases: preliminary proceedings, prosecution and execution. In terms of sentence execution, mediation should address suspending imprisonment and considering probation with goals and conditions to be met and its subordination to the effective restoration, compensation or other reparation for the victim. Mediation should be an opportunity for an effective reintegration into social and work life. Lastly, it is necessary to elaborate the Mediation Statutes. However, all this will come true when the Spanish society starts to change mentality, which entails abandoning the idea that all conflicts can be brought to justice, and when society relies more in the culture of dialogue as a positive way to resolve conflicts; this change must take place progressively. Moreover, the excessive number of cases brought to justice in Spain should lead to increasingly use mediation as the legal profession can indeed facilitate this process.